Discussion Board and Documents related to Qlik NPrinting. 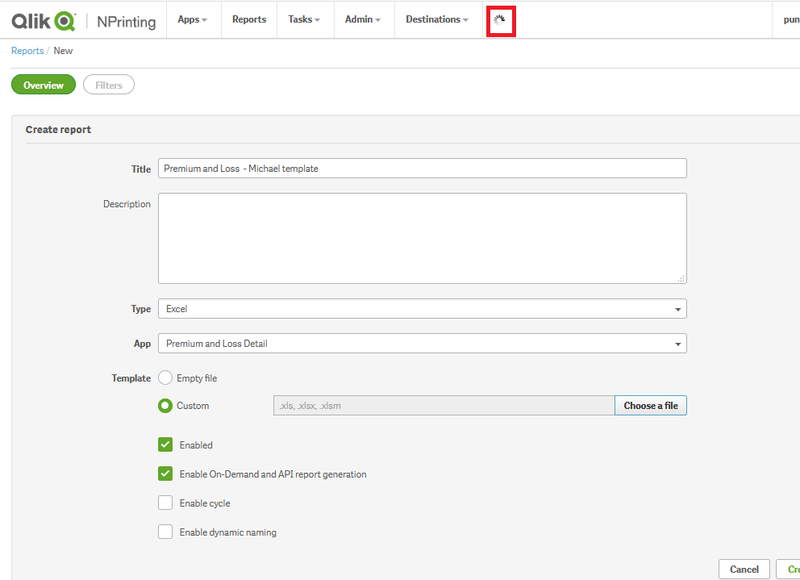 The April 2019 release of Qlik NPrinting is available! This release includes a new high value feature – Task Notifications, allowing greater efficiency for administration! As always, we are delivering quality improvements to meet the needs of our customers and their reporting requirements. Qlik NPrinting tasks can be chained to other Qlik tasks and executed from within a load script. This allows for full automation of the reporting workflow and creates dependencies with existing tasks, such as reloads. All of this can be done natively trough the Qlik NPrinting public APIs and the standard Qlik REST Connector. Qlik NPrinting contains a revamped architecture that allows customers to widen and grow their reporting use cases. As this happens, it is more important than ever to adopt some tips and techniques to streamline your Qlik NPrinting reports so that it runs efficiently. Ensuring that your Qlik application is designed well according to best practices is a prerequisite before you think about authoring reports in Qlik NPrinting! This is why a Qlik NPrinting report developer should be well versed in QlikView or Qlik Sense. It's analogous to a SQL report writer understanding SQL and SQL performance and even database performance. During this session, Qlik's Elite Partner GINQO will give an overview on their custom Qlik NPrinting solution and how it is being used to save lives fighting the Opioid crisis in Canada and show a few related best practices using conditional reporting and Qlik GeoAnalytics with Qlik NPrinting. You will also hear from Deloitte, as they talk about their TrueView app which provides customers with a unique Customer Experience on how they leverage the Qlik NPrinting Platform with Qlik. Qlik NPrinting February 2019 is now available! Hello all Qlik NPrinting users! I am pleased to announce that the February 2019 Qlik NPrinting release is now available. The Qlik NPrinting February 2019 release includes highly requested features, while delivering quality improvements to meet the needs of our customers and their reporting requirements. I'm building a report with ppt template with chart images from Qlikview document, but the image quality is low. I have some issues trying to get a combination of filters and conditions to work, however, for the purposes of this entry I am just trying to understand filters. I have a filter applied to my User Account in Nprinting. I have a report that is executed and that report is executed for me, so the filter I have against my account should be applied. 1. I apply a country filter of Great Britain, that value for Country exists in the data model and the report is properly executed and filtered, and I am delivered a report that contains data for Great Britain. 2. I apply a country filter of Test Country, that value for Country DOES NOT exist in the data model and I get an email that states that the report has an error. 3. I apply a Employee ID filter of 99999, that value does not exist, I get the error message in the email. 4. I apply a employee ID filter of 01643592, this value does exist in the data, it should return a report with 10 entries, it actually returns ALL data. So, #4 makes no sense to me, does anybody have any idea why this might happen? Please help us to fetch the Status and Completed data from the NPrinting API. you can use any host & NPrinting Task Id in below url. I'm creating a Word template for a Qlik Sense app and the variable I pulled into the template is not displaying the value. If I pull the variable into either the header or body all it does is display the formula and not the value when I try to preview. I tried with clic+shift, clic+ctrl and no more effect - It's the same thing with excel report. I do not understand, can it come from the config of the vm or the server or is there another mode of selection of the objects to deposit them in the model ? Does anyone know of any way to prevent the emails from going out when the jobs fail in QlikSense NPrinting? Also can we send out any automated email stating that the job has failed? I'm trying to rank region dimension on sales, for doing so the headers in the Qlik Sense are populated using firstsortedvalue() and rank(). Is it possible to change the header in the back-end excel table i.e. as per the screenshot below, I want to create dynamic header instead of series 1,series 2 etc. in PowerPoint template Qlik Nprinting. 1) I tried to use a custom excel file as NPrinting template, and it looks like it's being uploaded (see below red rectangle in screenshot), but after about 5 seconds it dissapears and no error message or warning is displayed. If I go end edit the template, it's just a blank excel file, as if the custom one didn't get uploaded. 2) Also, before having this custom excel that I wanted to use, I re-created the template from scratch, all saved ok etc. but when running the report, it took 18 hours (!!). I am not sure if this is a bug or it just lasts that long. The template has basically 1 sheet of source data, and 10 sheets with pivot tables based on the source sheet. The source sheet has around 27K rows, which is not that big, although it has 60 columns. When creating the pivot tables, I made sure the source sheet has each field brought separately, as opposed to just dragging and dropping the entire table object from qlikview. So the pivots seem to work ok when running the report. The 18 hours is what bugs me, so, again, any advice is valuable. I am creating a scatter chart in an excel template. In the template editor I add n chartxxx to tables. Then I move three fields to the excel template and insert them as a table. When I run a task with this template the output is correct. Entering the range manually or selecting the range makes no difference. How can i add label values from a range without crashing the template editor ? This is showing as intended in QlikSense dashboard. However, when the excel (.xlsx) report is generated in NPrinting Designer, the data type of the amount column is text. Are there any ways to change the data type of the column in NPrinting designer/template editor to number? I have actually tried to change the data type from 'general' to 'number' already. But it still does not reflect the change. I'm running on NP project implementation, the scenario is generated report will save in shared folder. So I created a shared folder in same server (mane: server A) then everything works smoothly. But there was some conditions, the generated reports has to save in different server (server B). In my opinion i just change the IP server and the path also, when i did it there was a warn said 'Impossible to save report in folder //serverB/path is denied'. Does anyone has idea? What should i do? Hopefully i get the advice asap. Thanks. Good day. I have been working with NPrinting for a while now. And so far I succesfully managed to create an Excel Report with Tables. Now I wanted to try out an Image export in either Excel or PowerPoint (preferably PowerPoint) but every time if I try to simply load a Picture I get the following two error Messages. In another thread I read that this could be because of an older Nprinting version but my Qlik Guys confirmed that we use the NOV 18 Version. "The "Identity" and the Qlik NPrinting Engine service account are a Windows domain user." I have a specific requirement from my client . 1)To store some charts by vendor code filter (i.e separate image for each vendor ) form various dashboards to a specific location in image format . 2) Also while storing the chart images , the image name should be the vendor code and exported date . 3) Also these images should be scheduled weekly . Can the above requirement full filled by Nprinting ? Qlik NPrinting April 2019 is now available!